If you are looking for a wedding flower that is elegant, graceful, and modern, look no further than the lovely calla lily. Available in several sizes and a spectacular array of colors, calla lilies make a wonderful choice for bouquets, centerpieces, and more. These are some of the ways to include calla lilies into a fabulous wedding design. Calla lilies are quite different than Asiatic or day lilies. Rather than a profusion of leaves fanning out from a center, calla lilies are shaped like one graceful open bell or vase. Their sleek form is wonderful for creating floral displays that are graphic, restrained, or contemporary. Callas can be used in more traditional ways, but for the most part, they are favored by brides seeking a modern chic style for their weddings. Your bridal bouquet is really like another accessory for your wedding gown. 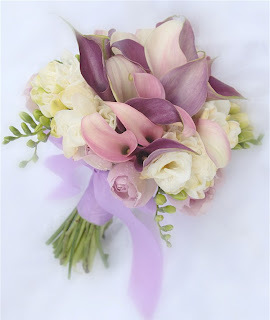 The distinctive look of calla lilies is perfect with certain types of wedding dresses. Their slender shape makes them ideal for slim gowns, especially those created from fabrics such as silk charmeuse or a fluid double faced satin. It is a fabulous and stylish look to pair the slim shape of a calla lily bouquet with a stiletto style pair of drop Swarovski crystal bridal earrings. If you want to introduce some sparkle into your bouquet, think about adding some Swarovski crystals to the handle wrap to tie in with your bridal earrings. Calla lilies make excellent single flower bouquets (as in one variety of flower, not one single bloom).They cluster very tightly at their stems, and then flare out to a beautiful full round bouquet. Another stunning option for callas is a dramatic arm bouquet tied with a big satin ribbon with long trailing streamers. This is an interesting alternative to the round bouquet, and it is also a nice way to showcase the long stems of the flowers. A nice thing about a bouquet that is nestled in the crook of your arm rather than held in out in front of you is that it does not obscure any of the details on your gown. If you choose to combine calla lilies with other flowers, look for ones that have a similar line. One gorgeous look is a round bouquet of callas that is bordered with a big ruffle of cybidium orchids. Orchids are one of the flowers most frequently paired with callas, as they have a complementary shape and also the same sense of sophistication and modern elegance. As textural accents within a grouping of calla lilies, you can try some of the spikier plants, such as bear grass, veronica, and grape hyacinth. 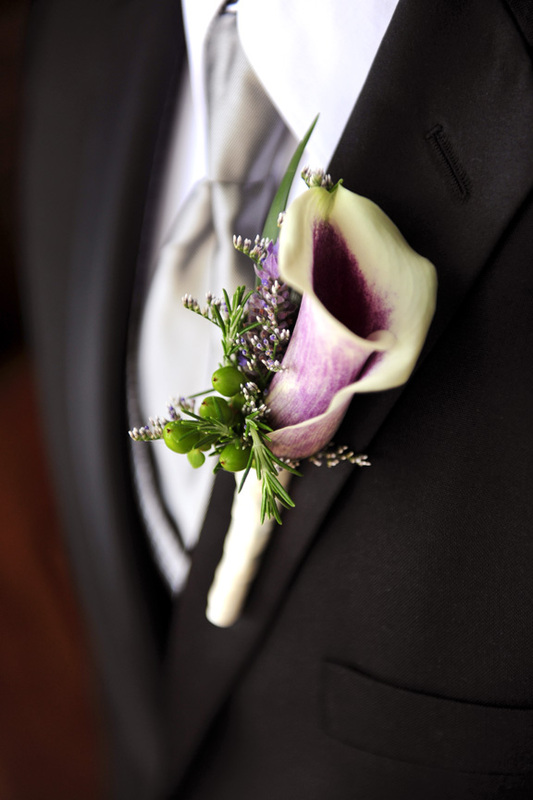 The clean lines of a calla lily make for a great minimalist boutonierre for the men in the wedding party. You can keep it completely simple with just a single bloom with a ribbon wrapped stem. If you want a little more detail in the boutonierres, introduce fun textural accents such as hypericum berries or even feathers. These are boutonierres that the groom and his attendants will be pleased to wear. 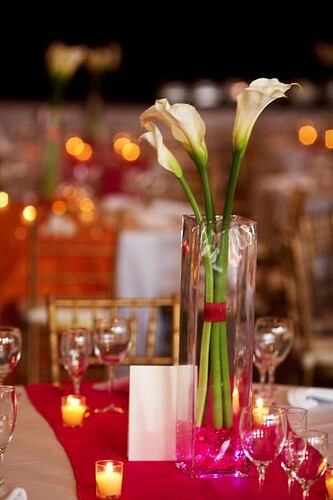 The graceful and lean lines of calla lilies and their impressive array of color options make them a natural choice for the centerpieces, as well. They tend to look best in simple arrangements that show off their unique shape and long stems. Tall clear vessels are the ideal vase for a chic calla lily centerpiece. 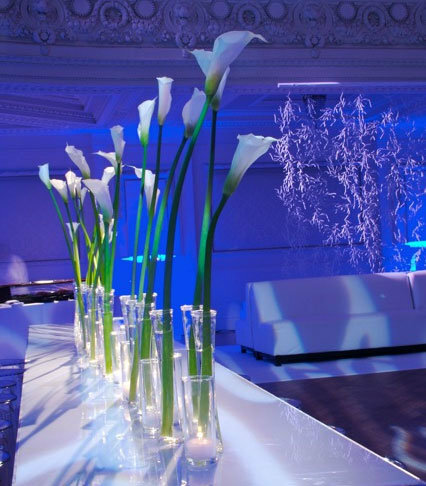 The elegance and modern style of calla lilies makes a wonderful addition to any contemporary wedding design.